I really wanted to share about this book and its author during Creative Inspiration Week, but long story short it didn’t happen. While I didn’t get it posted that week, the good news is that now I can give it the special attention it deserves. I suppose I’m not unlike many bloggers in that I’ve always hoped to write a real book someday. And, like many others, the blog slipped into my life at just the right time and has been wonderfully fulfilling. Yet I’ve always been kind of nutty about books, magazines, photo albums… I love them! So when I found a way to put together a few words and few pictures, and actually see it all in a bound form, I couldn’t wait to try it out. And that’s what Vintage Christmas is – my first try. Truly, just my own photos and a few of my own comments – nothing deep or complex. Because I was self-publishing I didn’t have to worry about what everyone else was going to think. I just put it out of my mind and told myself that if it’s garbage in the end, nobody will have seen it but me. It wasn’t really about whether it’s popular or not. For me, it was about trying. It was time to step away from my fears and give it a go. Now that I’ve waded into these waters, I’m excited to go a little deeper and start working on that “real” book! I am proud of her for taking this step and I really wanted to share it with all of you. I really encourage you to stop by and visit Polly’s . 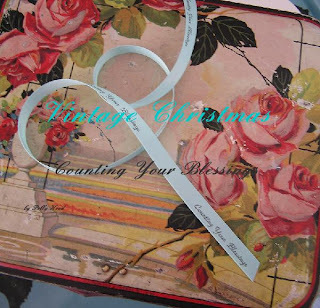 You can find out about her Vintage Christmas book and start reading a bit of her life story in her recent postings on her blog, which I am sure will make a fascinating book one day! I am turning off the comments on this post to honor Polly, who currently has her comments turned off on her blog as well! She is a humble person and wants to share from her heart. I love the idea of occasional silent posts, although I think I only managed ONE in spite of my intentions! In an effort to make Polly feel at ease about being featured, I decided to turn off comments on this post. I debated on this because I really wanted to be of encouragement to her and I KNOW you are the best encouragers EVER. But, because I want to be sensitive to her desire to have no comments on her own blog right now, I decided to follow that through for this. But I would love it if you would visit her blog and get to know her! You can however encourage her via email (info on her blog) if you want to contact her personally. Congratulations, Polly, on your first book! Thanks for sharing about your journey! In the new issue of almost every article refers to the word COZY. Of course, I was very drawn to that idea! Especially right this minute because I am absolutely freezing! I am wearing a coat with a fur collar, that is how cold I am, even in my house. If I could type with mittens on, I would. I am ready to go put on my PJ’s and leap under my covers to be cozy in my bed, but I want to be ON TIME this week for my Friday Sweet Escape so I am staying up a bit longer to put this together. Because I love you all, I am a dedicated blogger. So for our Sweet Escape this week, of course we must escape into Four Poster Bed Coziness! What? Is that lame? Pathetic? No adventures, no trains, no Scottish castles, no dreams of buying equestrian estates, just coziness? I know, this month just begs for posts on holidays and coziness. It is hard for me to focus on anything else! Speaking of being COZY, do you know what my favorite movies are to watch when I want to be cozy? Father of the Bride and Father of the Bride II. I have watched those movies dozens of times. I laugh and cry the whole way through. I love everything about those movies. I adore the house (it’s cozy), cry about the daughter getting married, laugh hysterically at Franc. I might have to go watch it again right now. Love that show. It is the kind of movie I just want to watch wearing my flannel pajamas and bunny slippers. In a four poster bed, if I had one. Ok, so coziness. Here are a few bedrooms with four poster beds that looked pretty cozy to me. Remember awhile back when I told you I was going to turn my whole third floor into a cozy master suite? I still am going to do that. Just haven’t gotten there yet, but I am still planning on it. A few of these cozy photos are my inspiration photos, so for those of you who have been my BFF you probably have seen some of them here before. Thanks for indulging me in my cozy fest. You know, one of my BFF Shelbi said the NICEST thing to me the other day (and please visit her blog for a great post on giving to a worthy charity!). She said I have the best girlfriend blog EVER. That is because I have the best girlfriend blog READERS ever.